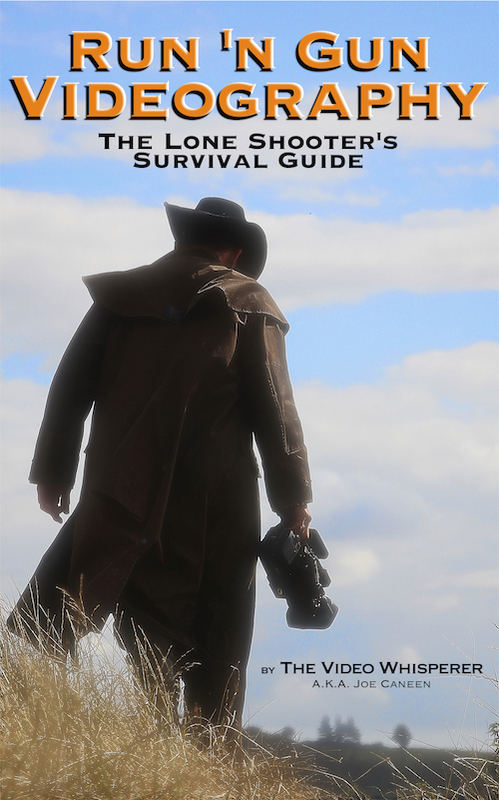 Chapter 12 covers various aspects of producing an interview-driven video. Specifically it covers a method of producing a corporate video without prior scripting. For that to work, Chapter 12 puts a lot of attention on a workable approach to conducting interviews. Good interview content, edited properly, can give you a much more sincere (and believable) narrative than any ‘scripted’ attempt because ‘scripts’ are best carried off by professional actors and presenters. The only problem there is that most people can spot them a mile away, so it’s a two-edged sword: Local talent are terrible at pulling off scripts and professional talent betray themselves as professional presenters reading script. On this page I’m going to use an example of my latest corporate video done for a company called Axiom which was subcontracted by another company (Logistex) which was coordinating a number of construction activities on the Superdrug distribution site. You will notice that no person from Axiom appears in the video. This is, in fact, a testimonial-type video whereby the end user (Superdrug) and the prime contractor (Logistex) are giving testimony on Axiom’s behalf. For those interested, this is a training exercise, so is therefore presented as a case study for the corporate video model laid out in Chapter 12 of Run ‘n Gun Videography. I will first link to the video itself so that you can watch it and then follow up with some screen shots of the editing timeline to illustrate a few points along with some additional comments. Let me start off with a comment about something you will notice in the first 15 seconds of the video: You will notice that you’ll hear the narrative content (voice) a full 15 seconds before you ever hear the person talking. 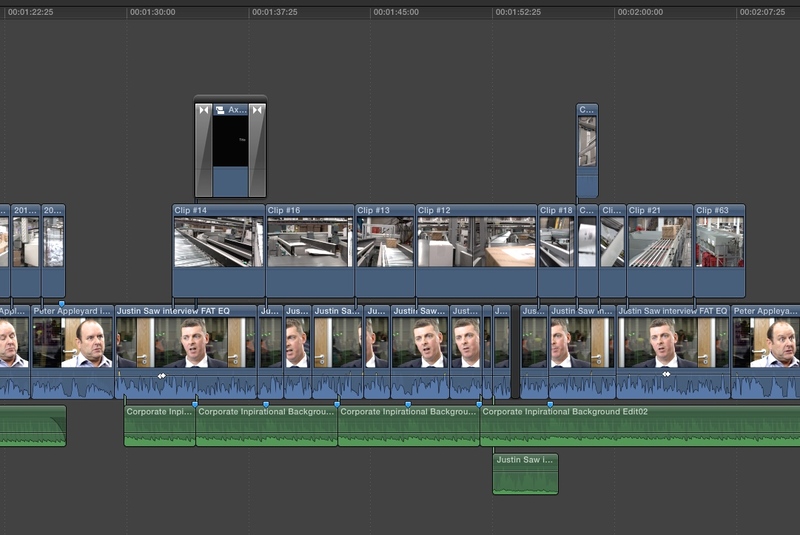 That’s longer than I would normally do, but in this case the specific reason you don’t see the person is that the first 15 seconds of narrative had 8 edits in it–mainly cutting out ‘ums’, ‘ahhs’ and longer than desirable pauses. That was necessary to build an introduction from the interview material available. 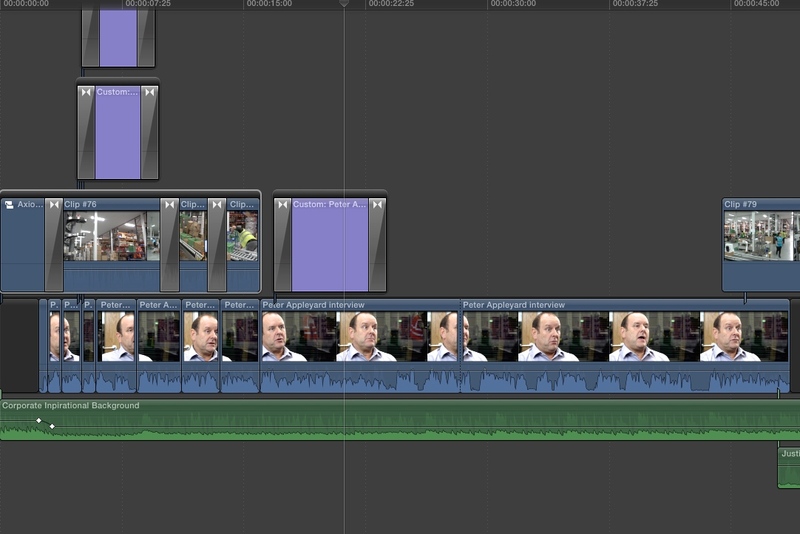 Here’s a screen shot of the beginning of the timeline showing the 8 edits in the first 15 seconds. The real key to seamless editing of interviews is to do it in such a way that no one would know there were any edits there by listening. It should sound to the listener as if that’s exactly how it was spoken live in the first place. As described in the chapter, the first step after importing the full interview content is to mix the audio if necessary. That’s because you’re about to cut it up into a lot of pieces. If you mix the audio afterwards, you’re going to have to apply the mix to all the individual pieces, so this is an elementary time-saving step. In the case of this video, there were two interviews totaling about 25 minutes of material. After mixing the sound on the two interviews I then went through each and cut out all of the extraneous and unusable or irrelevant material (such as all my questions and bantering) leaving only the material that I would be drawing from to construct the narrative. While I did each interview in separate projects, I’ve combined them here on the same timeline for ease of illustration. That’s the 17 minutes of material I would be working with to create the narrative. The next series of steps are a process of moving those pieces around into an order that will tell the story you want to tell. For example, you’ll find certain things suitable for possible beginning bits and others for possible ending bits. You just shuffle them around roughly in this fashion. Once you’ve got things more or less in order, now start deciding what the best and most relevant material is and what the worst or least relevant material is. Once you’re certain you won’t be using certain bits, start deleting them. Now you may find your 17 minutes of material is down to 9 minutes. But you’re going for a 3 minute video, so there’s lot’s more to do. In this fashion, you start building your narrative out of the most relevant pieces. At this point you’re not concerned with any flaws in delivery such as um’s and ahs or other peculiarities such as always starting a sentence with ‘yeah…’ or any number of other quirks. You just was to see if you can put together a cohesive story that gets the point across. In other words, you’re concerned with message. Sometimes you will find the same thing was said in two different ways at different times. Take the best of the two and delete the other. Keep paring it down and clarifying the message. Finally, when you’ve got your content down to the right length for your video (there’s no hard and fast rule except that the content should maintain interest for the prospective target viewer–in this case, someone looking for an industrial sortation system), now you can start fine-tuning it. If you haven’t already, decide where you want to guy to absolutely appear on camera. The rest of the interview is fair game for editing. Now you can start slicing and dicing to remove the unwanted pauses, the self-corrections (happens a lot–they’ll start talking and then start over repeating what they just said, they’ll say a word wrong and correct themselves, etc.). You can freely trim all that stuff out and pace it all nicely together (even if you have to add small gaps in the narrative when things seem to run together too quickly). By the time you’re done with that, you’ve probably cut out another 10, 15, or 20 seconds or more. You haven’t changed the content, but you’ve cleaned it up and clarified it. Naturally when you get to the step of covering up all those edits with B roll, you will have to have some relevant B roll to cover those points so that it too is contributing to the flow of the story. Incidentally you can also see a place where I added in a small gap in the narrative for reasons I can’t remember, but which improved the overall narrative. You’ll also notice at the very bottom a piece of track in there which overlaps the gap. That’s room ambience that I recorded (which contained the factory noise in the background) so that the gap wouldn’t suddenly go ‘quiet’ and betray itself. And while the subject of a different chapter in the book, you can also see where I extended the music track by finding a phrase of music that I could repeat at this point in the video so the music ending would correspond with the end of the video. There’s nothing particularly novel or revolutionary about this approach. Editors have been doing this for a long time, but for those of you working on your chops, I hope you will have found this to be useful.